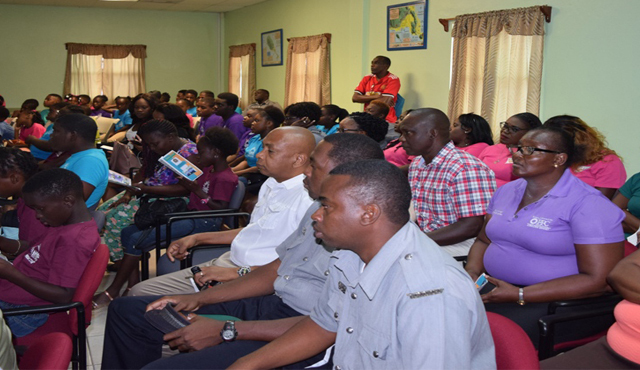 Basseterre, St. Kitts, Monday, 5th April, 2019, (MyVueNews.com) – The first, in what is to become a series of public discussions, attracted a large number of citizens on Thursday, 4th April, 2019, when security officials hosted a town hall consultation at the NEMA Conference Room in Lime Kiln. Addressing the gathering was Assistant Commissioner Responsible for Crime detection and prevention, Andre Mitchell. The meeting was designed to discuss issues relating to crime and violence, gangs and measures for protecting children and teenagers from gangs, and other undesirable activities. Mitchell said that now the communities are becoming more diverse, the issue of crime prevention requires the contributions from everyone and not just the police. He said that crime is something that should be tackled from a holistic front – the family, the schools, businesses, social services, and of course the church. “As a people, we must reverse the trend that currently exists. No efforts must be spared in steering our youth towards nation building,” continued the senior officer. He used the occasion to commend the Community Policing Team for its hard work and dedication, and for taking the initiative to positively re-shape the minds of the youth population.